What’s in my bird seed? 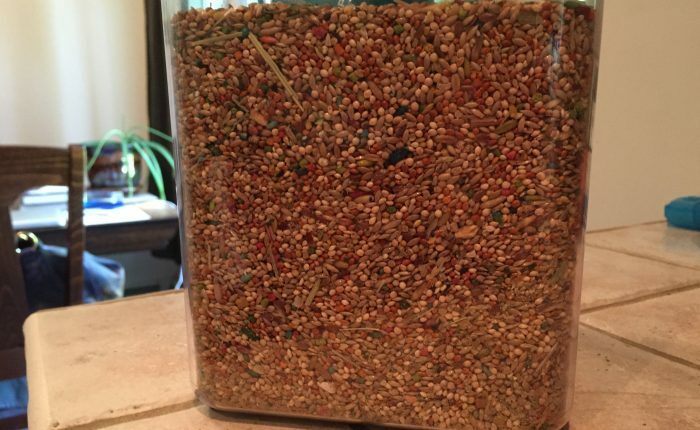 This is my beautiful bin of air-tight seed, it’s a mix of one commercial brand of seed plus two seed mixes I buy from a local bird center, because I am a mad scientist of bird feeding. 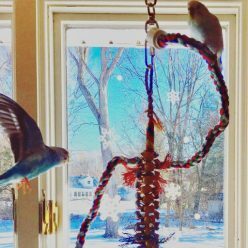 Every morning I lovingly scoop pellets and then this seed mix into two separate bowls, usually while sweet-talking the parakeets about what a fantastic breakfast they are about to enjoy, and then…..
this morning I found these living in my magical seed mix. It turns out they are Saw Toothed Grain Beetles, and I should check out my cereal boxes, because apparently they are very crafty and can chew through packaging. In this case I’m sure they hitch-hiked with one of my various seed mixes. This bin is currently in the freezer, I think the outdoor birds are going to have Christmas in July and I have some new seed coming tomorrow – the price of the shipping exceeded the cost of the seed, which is still a small price to pay not to deal with any more beetles! Hopefully the parakeets enjoy Kaytee Forti Diet Pro Health Food for Parakeet, 5-Pound , I think I’m done mixing for a while.